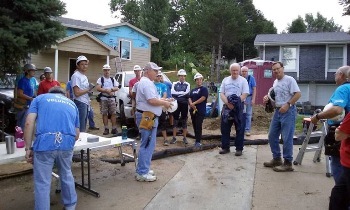 The Faithful Builders Coalition is making great progress building this new Habitat for Humanity home in west Omaha! And our 2U volunteers have been a big part of the action. View of the new home from the southeast. The roof is done complete with ridge vents, and the windows are installed. 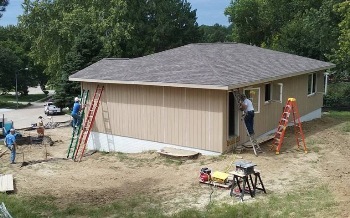 On Saturday, September 1st the siding was completed. So now the interior of the house is protected from the elements. Habitat Supervisor, Ed Thiele (on the right in the gray shirt), giving a safety briefing to the crew before work begins. Work by volunteers resumes Friday, September 28th. In the meantime, contractors will install the electrical, plumbing, and heating/air conditioning. Then the City will inspect the work before drywall installation begins. Volunteering at the work site has been a wonderful and educational experience. Habitat’s Ed Thiele is an excellent and experienced supervisor, and the volunteers from the other congregations are great to work with. Not too handy with a hammer? On October 13th, Second Unitarian volunteers will provide the morning snack and lunch for the workers. 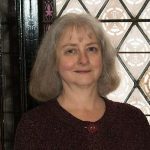 JoAnne Draper has graciously volunteered to be the food coordinator. Please contact JoAnne if you would like to help bring food and/or beverages.. Thanks to those of you who have participated in this project. I encourage the rest of you, if you can, to join us for one or more of the remaining work days. 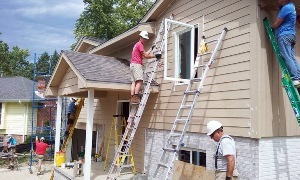 To reserve your spot, check out the remaining dates and register at habitatomaha.org/volunteernow. Create an account (if you haven’t already), using your email address and the Reservation Code FB2018. If you need assistance or more information, please contact Clyde Anderson. Looking west. That’s Larry Kurtz caulking the siding near the back door.